Reminders’ AppleScript Dictionary (viewable in AppleScript Editor -> ⌘⇧O or through File > Open Dictionary…) allows us to fetch the app’s configured accounts, list names, and, more importantly, to create new reminders with specific parameters. 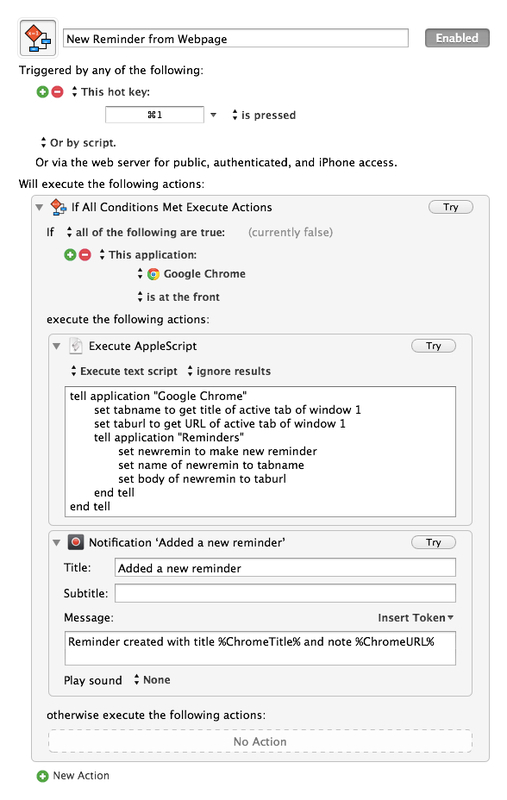 Through AppleScript, we can programmatically create reminders that have specific names, attached notes, priorities, and dates. For this tutorial, I’m only going to focus on creating reminders with names and notes set by AppleScript, leaving other parameters to your discretion (and imagination for script personalizations). For Safari users, the basic idea is the same, but note how the AppleScript Dictionary changes title to name and active to current for tabs. I have no idea why Google went for this minor difference when building AppleScript support into Chrome. As you can see, the macro is only activated after I hit the ⌘1 shortcut and if Google Chrome is at the front (the macro is also assigned to a Chrome-only macro group); I’m using the same AppleScript, but I’ve added a native notification to be displayed after a reminder has been successfully added. Thanks to Keyboard Maestro 6, we can customize the text that will be shown by Notification Center using a mix of plain text and tokens dynamically generated by %ChromeTitle% and %ChromeURL%. Replicating OmniFocus’ Quick Entry panel is a bit trickier, but still doable thanks to AppleScript. I have put together a script that, when launched, will tell OS X to display a dialog with an empty text field where we can type the name of the reminder we want to add. This dialog can be activated at any time, much like OmniFocus’ Quick Entry. The empty text field is generated by the blank default answer and the dialog is automatically cancelled after 20 seconds thanks to giving up after. I think the nicest touch is the custom dialog icon, which is Reminders’ own icon fetched through with icon path to resource – the key is to tell AppleScript to go look in bundle. The downside of interacting with dialogs generated by OS X is that you can’t have the fancy custom interface of OmniFocus’ panel; you’re limited in the number of buttons you can add; and it’s moderately complex to customize the dialog window with additional options for things like notes or dates (which I have purposefully advoided to keep the script as simple as possible). If you’re looking for more advanced AppleScript solutions that work around natural language parsing for date and time, I’m sure you can find some online. You can download the Keyboard Maestro macros here.